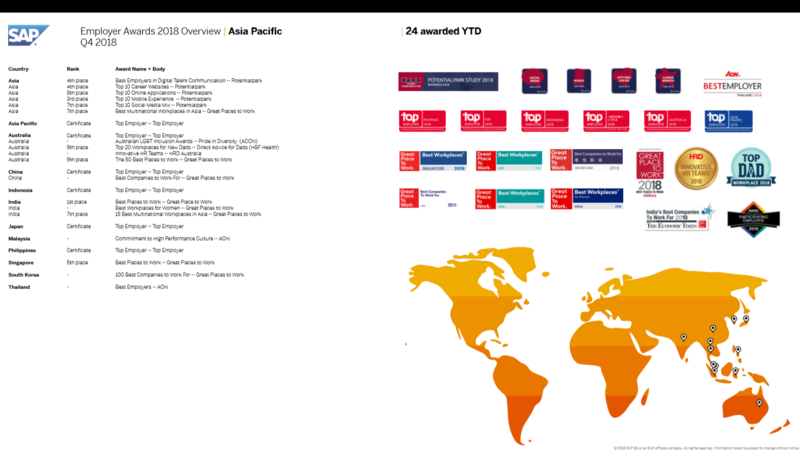 What a year it’s been for SAP. Again, SAP is a leader in the cloud and software industry making great strides in its mission and vision to help the world run better and improve people’s lives. 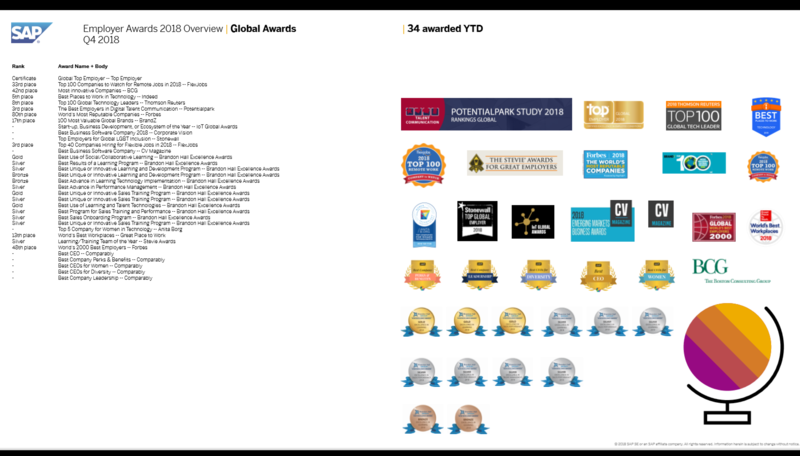 I’m excited to share that we’ve counted up the 2018 results and SAP has been honored with 175 employer-of-choice awards, certifications, and recognitions. Take a look at these awards below and you’ll see diversity awards, HR awards, best workplace awards, happiest employee awards, and more. Sometimes people ask me why it’s so important for SAP to apply for awards and certifications. I always answer that these recognitions help validate that we are a reputable, credible, and leading employer-of-choice. We at SAP can spread our message of what it’s like to work here across multiple channels, but when third-party organizations like Top Employer, Great Places to Work, and others give us their certifications, it shows employees and candidates alike that SAP is a leader in its employee working conditions. 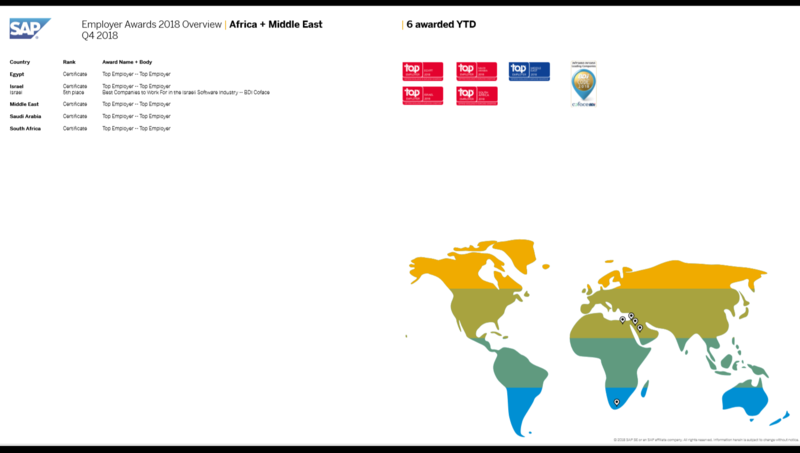 In 2018, SAP was in fact, certified by the Top Employers Institute for its exceptional employee offerings in 22 countries and 4 regions (Europe, Middle East, North America, Asia Pacific) and received its first Top Employers Global Certification. This is an exceptional recognition of our excellent employee conditions, talent development throughout all levels of the organization, and continuous improvement of employment practices. Shortly thereafter, Great Places to Work honored us for the second year in a row with their global seal of recognition as well. Additionally, SAP received 12 Brandon Hall Excellence Awards, including three golds in Best Use of Social/Collaborative Learning, Best Unique or Innovative Sales Training Program, and Best Use of Learning and Talent Technologies. SAP is also keeping its titles this year as a Top Company for Women in Technology by the Anita Borg Institute, a Most Valuable Brand by BrandZ, and a Top Company for Remote Jobs thanks to our abundant flexible working options and emphasis on work-life balance. 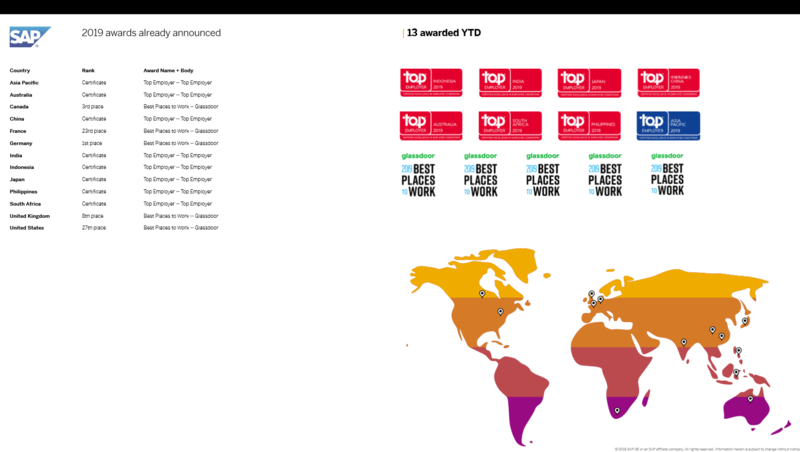 Already poised for a successful start of 2019, I’m also proud to announce that SAP is the only company in the world to be on all 5 of the annual Glassdoor Employees’ Choice Best Places to Work 2019 country lists, making the list in the U.S., U.K., Canada, France, as well as receiving a first-place win in Germany! No other company made 4 lists in 2019 and only 3 companies made 3 lists. 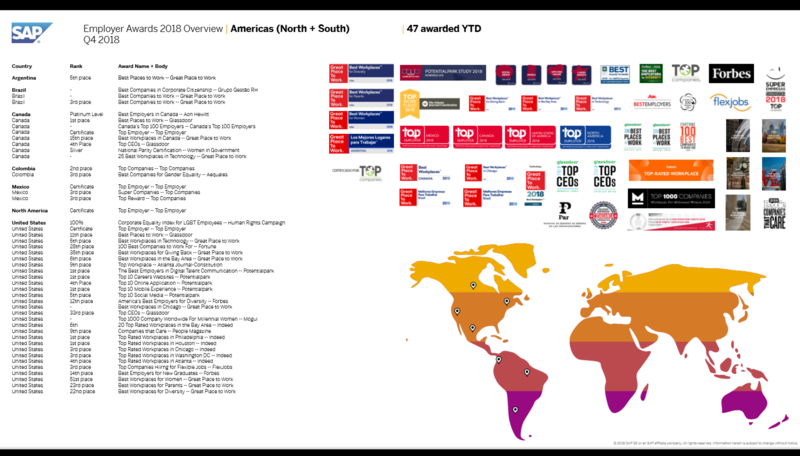 To reiterate what an awesome place SAP is, this is the second year in a row that SAP has been on all 5 lists! 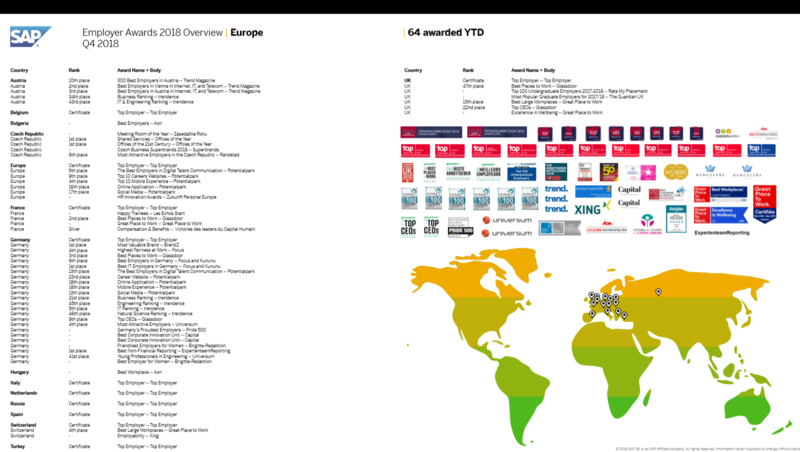 Take a closer look at our 2018 awards graphic and stay up-to-date on what it’s like to work at SAP by following us at #lifeatsap! Congratulations, everyone at SAP!